THE honest truth is, for a comedian, even death is just a premise to make jokes about. I know this because I was on the phone with George Carlin nine days ago and we were making some death jokes. We were talking about Tim Russert and Bo Diddley and George said: "I feel safe for a while. There will probably be a break before they come after the next one. I always like to fly on an airline right after they’ve had a crash. It improves your odds." I called him to compliment him on his most recent special on HBO. Seventy years old and he cranks out another hour of great new stuff. He was in a hotel room in Las Vegas getting ready for his show. He was a monster. You could certainly say that George downright invented modern American stand-up comedy in many ways. Every comedian does a little George. I couldn’t even count the number of times I’ve been standing around with some comedians and someone talks about some idea for a joke and another comedian would say, "Carlin does it." I’ve heard it my whole career: "Carlin does it," "Carlin already did it," "Carlin did it eight years ago." And he didn’t just "do" it. He worked over an idea like a diamond cutter with facets and angles and refractions of light. He made you sorry you ever thought you wanted to be a comedian. He was like a train hobo with a chicken bone. When he was done there was nothing left for anybody. But his brilliance fathered dozens of great comedians. I personally never cared about "Seven Words You Can Never Say on Television," or "FM & AM." To me, everything he did just had this gleaming wonderful precision and originality. I became obsessed with him in the ’60s. 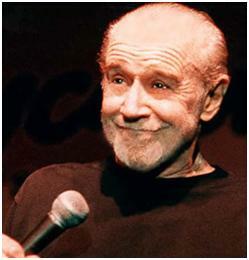 As a kid it seemed like the whole world was funny because of George Carlin. His performing voice, even laced with profanity, always sounded as if he were trying to amuse a child. It was like the naughtiest, most fun grown-up you ever met was reading you a bedtime story. I know George didn’t believe in heaven or hell. Like death, they were just more comedy premises. And it just makes me even sadder to think that when I reach my own end, whatever tumbling cataclysmic vortex of existence I’m spinning through, in that moment I will still have to think, "Carlin already did it." Jerry Seinfeld is a writer and a comedian.